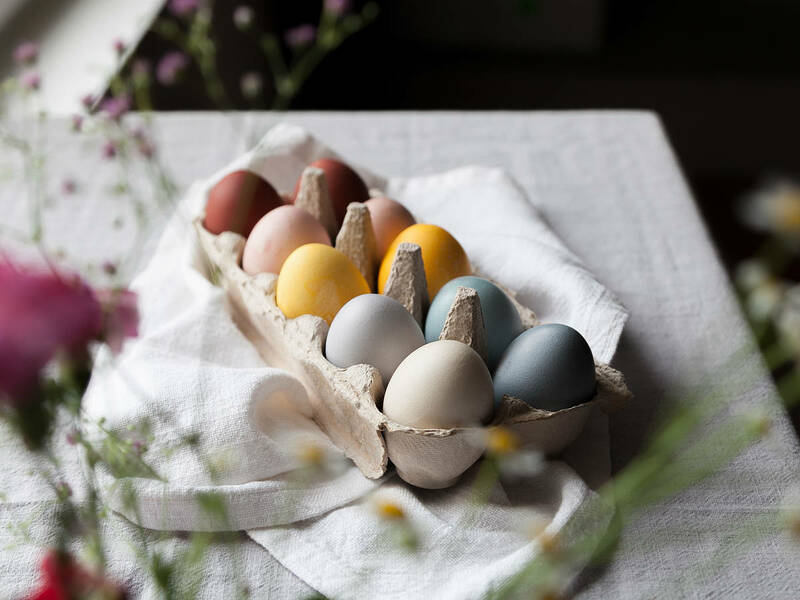 Colorful eggs are a staple of Easter celebreations, symbolizing new life and the start of spring. Over the course of the weekend, they’re boiled and dyed using a variety of techniques. But if you’re not thrilled about using common synthetic dyes, it’s time to turn to natural resources. While the colors are often less intense, they’re free from chemicals and undesired side effects. So say goodbye to storebought dyes and hello to fruits, veggies, and spices! You’ll get the best results by using natural foods that are intense in color themselves, such as red cabbage, beets, and coffee. Follow our tips and enjoy a colorful Easter! 1. If you’re going for pastels, use white eggs. 2. You can either use pre-boiled eggs with a cooled dye solution, or cook raw eggs in dyed water for approx. 10 min. until hard-boiled. To achieve intense and smooth colors, we suggest the hot-dyeing method. For low-temperature dyeing, always remember: The longer eggs are kept in the dye solution, the more intense the color will be. 3. Adding vinegar to the water helps to improve color absorption. Simply add 1 tbsp. of white vinegar per cup of water. Alternatively, rinse eggs with vinegar before dyeing. 4. Mason jars or old yogurt cups are suitable for dyeing, since the egg will be fully submerged in the dye this way. 5. Use a cooling rack to dry eggs, then rub them with oil on a paper towel to make them shiny. You’ve probably noticed that simply chopping red cabbage leaves marks on your hands. So, it’s no wonder that red cabbage is a perfect natural ingredient to turn eggs blue and purple colored. Chop red cabbage and add to a saucepan, followed by water and vinegar. Bring to boil and simmer for approx. 30 min. on low heat. If desired, you can already add eggs to the pan at this point. Alternatively, drain colored stock. Make sure to transfer the stock to another bowl, let cool, then add eggs one by one. If you want blue eggs, add 1 tsp baking powder to solution. An old-fashioned and simple method for dyeing eggs is with the help of a stock made from onion skins, which result in golden oder red-brown eggs. Add to a saucepan and simmer for approx. 30 min. Afterwards, the dyeing fun begins! Turmeric, also known as yellow ginger, is the natural ingredient for a bright yellow color. You can find it in nearly every supermarket. Add to saucepan and simmer for approx. 30 min. Let cool, then start dyeing. Red beets are the magic bullet for pink Easter eggs. If you’re short on time, use ready-cooked beets, but if you have the time, you can start with fresh. If you want the eggs to turn a pale rosé, rinse cooked eggs with vinegar and add to beet juice for approx. 10 min. If you want to have bright pink eggs, heat up the juice, add raw eggs, and keep simmering for approx. 10 min., until eggs are hard-boiled. Time to dye those eggs! Have a great Easter!